Canada's farmers are getting older, and young farmers fear concessions made at the NAFTA table may make it far harder for them to stay in business. A group of young farmers staged a protest outside Prime Minister Justin Trudeau's riding office in Montreal today, sending a message to Canadian negotiators to keep fighting for them at the NAFTA table. 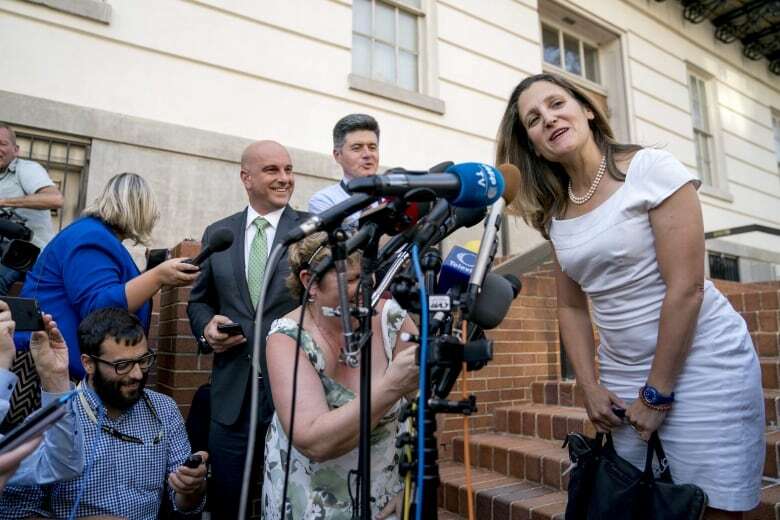 Julie Bissonnette, one of the organizers, told CBC News they want to remind those negotiators that as Canada decides which concessions it must make to reach a new North American trade agreement, their future is on the line. Hundreds of younger farmers were expected to join the protest from as far away as Alberta, Manitoba and New Brunswick. While many represent Quebec's politically-active dairy sector, farmers in other sectors are worried as well. In 2017, Statistics Canada reported that the average age of a Canadian farmer was 55. More farmers are over 70 than under 35. If negotiators feel forced to settle for compromises that harm Canada's rural economy, those older farmers could push for taxpayer compensation — simply sell out and retire. The more difficult question is how to craft an agreement that makes it possible for younger farmers to stay in the game. The agriculture and food sector remains a top employer overall in Canada, with many competitive advantages internationally. Trade negotiators have to make sure it stays that way. The leader of Canada's negotiating team, Steve Verheul, comes from an agriculture trade background, so there's no question he understands what's at stake. The current NAFTA round isn't the first trade negotiation which saw agriculture matters put off until the end. It's actually standard operating procedure for Canadian negotiators to get the other chapters done first. Agrifood sectors in other countries — European cheesemakers during the EU talks, New Zealand butter exporters in the Trans-Pacific Partnership and its successor, the CPTPP — have long had designs on Canada's markets. The 25-year old NAFTA agreement treats agriculture as a series of bilateral agreements. A small crowd of players in Canada's food and agriculture sectors has formed in Washington this week, trying to influence the final, difficult choices Canada needs to make. While chronic oversupply issues depress global prices for dairy, Canada's system of quotas to control how much its dairy, poultry and egg farmers are allowed to produce is is unique in the world. But outside of supply management, there's big money to be made in the export-oriented farm sectors. Canada has always been a huge player in international grain markets. And after some rough years of disease-related border closures and depressed prices, Canadian livestock farming (beef and pork) is once again in expansion mode, trying to take advantage of new market opportunities in Asia and (to a limited extent, now) Europe. But the closely-integrated north-south movement of grains and livestock still defines Canada's farm trade — which is why the exporters are in Washington, making sure new non-tariff barriers don't sneak their way into the fine print. It wouldn't be the first time. Canada and the U.S. battled for years over American country-of-origin labelling (COOL) requirements, before the Canadian side ultimately prevailed and was awarded remedies. No one's ever sure what the U.S. will try next. The players on defence are familiar by now: dairy, egg and poultry producers bracing for diminished markets, quietly convening briefings and relaying updates back home. They're still waiting for the call that matters, though — the one where the lead negotiator pulls them into a room and walks them through what's about to hit them, explains why it was necessary and (hopefully) lays out a plan to mitigate the damage. When Canada's supply-managed agriculture sector took a hit in the Trans-Pacific Partnership negotiation, the previous Conservative government had a $4 billion-plus compensation package already sketched out. This time, however, it's not clear whether the current government knows what it's prepared to do for the sector this time — how much Finance Minister Bill Morneau might be setting aside for compensation in his final pre-election budget, or what form that compensation might take. The more modest sums earmarked to help the industry modernize when the Canada–Europe deal kicked in were depleted in no time. The Liberals are still consulting on potential compensation for the now-11 country (minus the U.S.) CPTPP, now at the ratification stage. No one expects Canada to make a NAFTA concession smaller than what the U.S. secured in the original TPP deal. The Trump administration is on a mission to deliver more, more, more — politically, it can hardly afford to settle for less, especially given the hits the vote-rich American farm belt has been asked to absorb in recent months. So what would "more" look like, especially for the dairy industry? That's the question on a lot of minds in Washington this week. 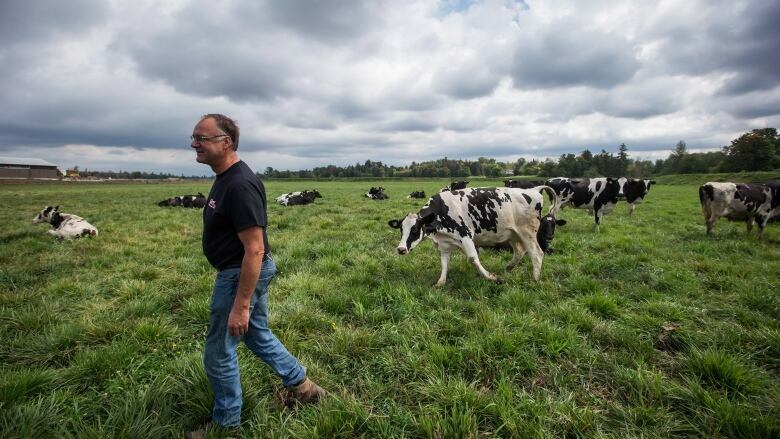 According to industry estimates, the hits Canada absorbed to land its European and Pacific Rim trade deals (roughly valued at two per cent and 3.25 per cent of Canada's total milk market, respectively) will cost the dairy sector about $250 million a year. Even if consumer demand keeps growing, consistent slices of that growth — if not all of it — will go to foreign farmers from now on. It's possible that another slice — a significantly larger one — is being measured right now. That's depressing and demotivating for those working to improve the industry's competitiveness, spokespeople say. Anyone remember that old game Kerplunk? Think of the marbles as commodities, the sticks as the supply management system that supports them. Trade deals keep pulling out stick after stick. With each stick withdrawn, Canada's system becomes less stable — closer to losing all its marbles. But at least it's possible to calculate and prepare for that kind of concession, as the Department of Finance reportedly is doing. The bigger worry right now is about the future of the Class 7 policy — the understanding reached between farmers and dairy processors to agree on a lower, internationally-comparable price for dairy ingredients to remove the incentive for Canadian processors to use cheaper diafiltered milk imports entering Canada through trade loopholes. Many argue that the government can't just negotiate Class 7 away, because it was a private industry agreement, not a government creation. But if provinces put enough pressure on their marketing boards to comply, hands could be forced. There's bitterness in Canada's dairy sector over the way the U.S. has approached the Class 7 question — how the Trump administration, especially U.S. Secretary of Agriculture Sonny Perdue, embraced it as a cause. Americans could have responded to Class 7 by cutting their own diafiltered milk prices to compete with Canada's lower ingredient price. They didn't. Meanwhile, U.S. dairy farmers are taking part in a new $12 billion trade compensation scheme, along with the subsidies they already get. Were the U.S. losses from Canada's policy changes more hypothetical than fact? The Americans changed the way they enforce cheesemaking standards, making it easier for them to use diafiltered milk. The U.S. still has an overproduction problem, but its industry is showing signs of contraction. One Canadian processor who still buys American ingredients reports being able to get an order filled within 48 hours in the past. It takes two to three weeks now. For Canada, the worst-case scenario would include both an end to Class 7 and another slice of market access traded away. There are a few seats in Congress that can be won or lost based on how angry dairy farmers get, and those farmers have had a loud voice in the NAFTA debate so far. But Congress hasn't debated NAFTA's final package of tradeoffs yet. In fact, the Congress that ends up debating that package won't be this one, but the one elected later in the fall. That House will no longer be led by a dairy-conscious Republican from Wisconsin, for example, because Paul Ryan isn't running. Add this to the general climate of chaos surrounding the Trump administration, and it must be hard for the Canadian negotiators to feel confident that anything they agree to this week will actually come to pass. When negotiators give up too much, too soon, the other side comes back for more. A card laid is a card played in trade talks — once offered, Canada's dairy industry will never get it back.